I like silky foods. I enjoy the texture of things pureed, or liquids set with a coagulant (like tofu or panna cotta) or rich, runny yolks. If you don’t like those things because of their texture, you might not enjoy this spinach. It’s a lot like creamed spinach, but vegan–made with coconut milk, not dairy–and scented with fenugreek and turmeric. I find it a comforting dish because it’s mild, served hot and smooth going down, but also because it makes me nostalgic. It reminds me of a dish Mrs. Stymek used to make for her family when I hung out with her daughter Jennifer after school. My parents were working shifts and I ended up there some afternoons waiting for a pick up, and I’d watch weeknight dinner come together in their kitchen. There was always meat, there were always mashed potatoes from what I recall. But slightly less expected, there was spinach, steamed and then blended to a thick but smooth puree, poured out onto Jennifer’s plate. Sometimes she ate early and without her family, and at those times I was offered a plate too. I accepted though the food was unfamiliar and I wasn’t sure if I’d like it or even quite how to eat it. I followed Jennifer’s lead and scooped the spinach onto the tip of my fork, and then some mashed potatoes before delivering the bite to my mouth. They were fine separately but much better together in one mouthful. The contrast of silk to starch was lovely and stood out enough in my mind that I have thought about that mouthful many times. You have probably done this with creamed spinach and mashed potatoes in steak houses? Maybe you enjoy this combination often. I hadn’t experienced this bite in ages, until this year. My mom made the spinach in this recipe for me recently when I was recovering from a small surgery. I was sick to my stomach from pain killers which I’d taken in the hospital and which insisted on leaving my unhappy system as.slowly.as.possible. I had just managed to keep some apple sauce down successfully and was feeling crummy from being weak, when my mom decided to make something nutritious but “easy” for me to digest. I ate it, it was easy, she was right, and I felt much better within minutes after I’d say. It was also “easy” for James to finish the leftovers, which he spooned over very soft rice, because while delicious in it’s own right, I think it was perfect with a soft starch. You could eat this with rice like I do, or beside steak too, but I suggest you make sure there are mashed potatoes. I can vouch for its gentleness on an upset stomach and it’s ability to fortify, but I hope you simply enjoy this in good health. Add all but the leaves to large pot and simmer gently over medium heat until the shallots have softened. Add about a third of the spinach to the pot, mix well. Then add the remaining leaves, turn the heat up to medium-high and cover the pot to steam and wilt the leaves for a couple of minutes. 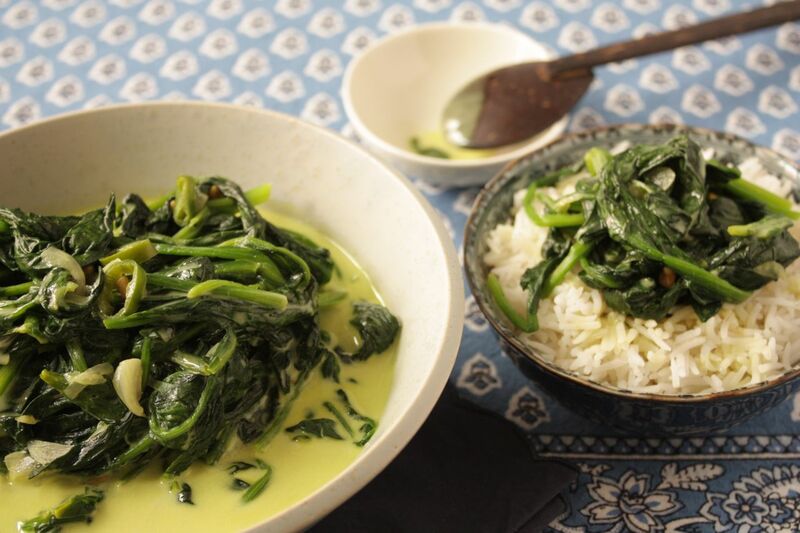 Uncover, mix well and cook at a strong simmer for 7-10 minutes, stirring occasionally until the spinach has cooked down, the stems are tender and the sauce has thickened slightly.